Rin Tohsaka is from Fate/Stay Night Unlimited Blade Works which is a story about the fifth Holy Grail War, a secret magical tournament, wherein Rin is a master and Archer is her servant. She is also a skilled magi with a tough exterior but a kind heart. 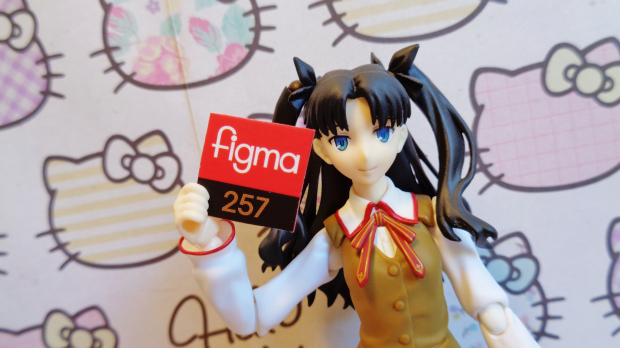 As far as paint goes she is what you expect from a figma, her paint work is good with no mistakes to be seen. The sculpt is also what you would expect with just enough movement in her clothing and hair to bring her alive without having her look permanently windswept. She is also very character accurate in my opinion. Then there is the articulation, she uses the all the standard joints with the exception of a new waist and new shoulders. The waist now has a section which you can pull down in order to allow her greater movement, however to be honest it makes little difference and she can't hold poses when it is stretched out. 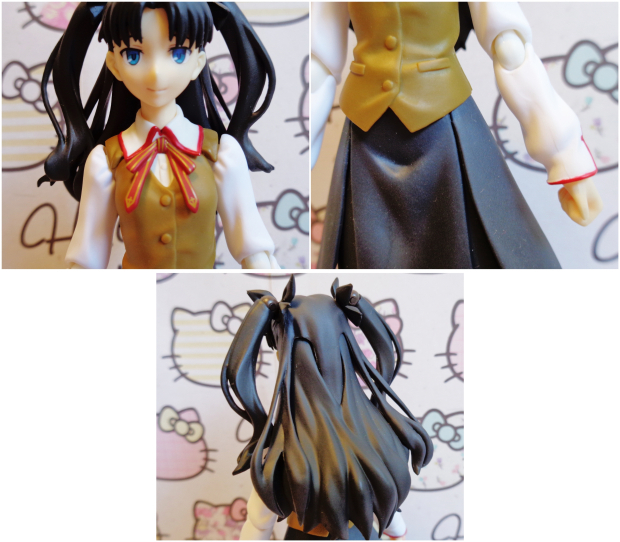 Then there are the shoulders, you are now able to pull the joints outwards in order to extend her arm further. This allows to do her poses that she wouldn't normally do, however once again the joints are kind of loose which means when you are posing her, her arms continuously need readjusting so that the weird gap the new joint makes doesn't show. As for restrictions the only real place is moving her legs backwards but this is minimal. Extra articulation includes her hair which is in thee sections, her two pony-tails peg into her head and can swivel, they also have the same joints as her wrist for added motion. Then the back piece of her hair is on a hinge. 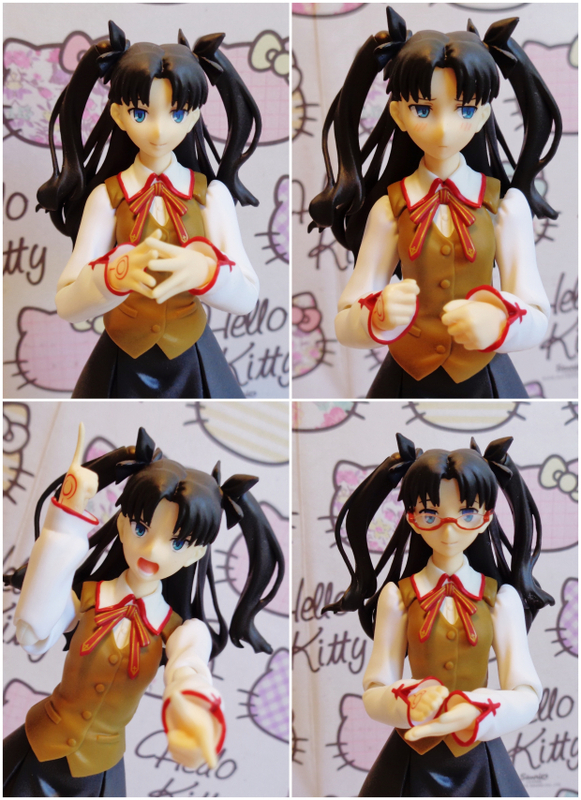 The first accessories Rin comes with are three face pieces, the first is her default smiling face, the second is an embarrassed face, and the third is a yelling battle face. As for the hands you get fists as default, a pair of open hands, a pair for holding items, pointing hands, and a pair of flat hands. Her glasses are included attached to second fright piece, however mine came flawed or misshapen or something because at first I could only get it to fit when the default smiling face was on. After attacking it with a knife though I was able to shave away the plastic peg to get it to fix, however I should not have to do that! An alternative pair of shoes is also included, for wearing inside her school I believe, and then there are pieces which make up her Gandr spell. 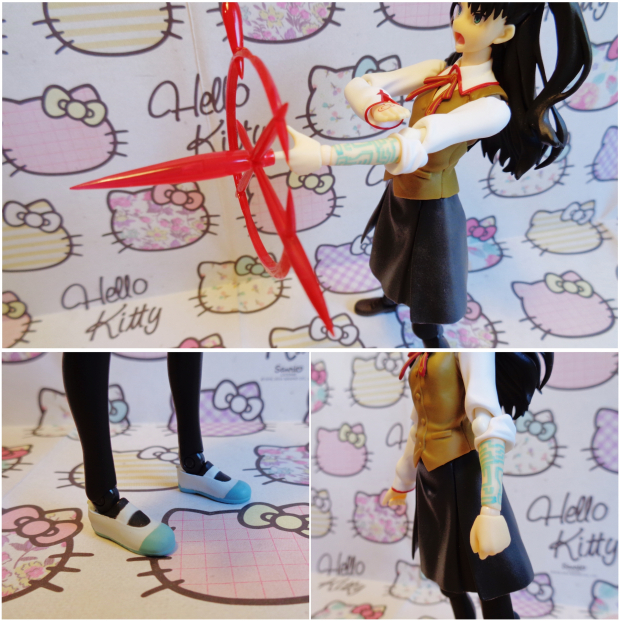 First there is an alternative left arm where the sleeve is pushed up revealing her magus sigil. Then she comes with the firing effect, which comes in two parts the point of which pegs onto the main section which then pegs onto her pointed finger. 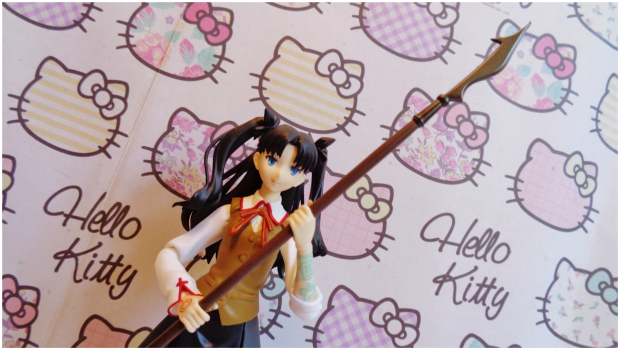 Overall I think Rin is an awesome figure, however I think if they had stuck with the regular waist joint she would have been excellent and although the extendable arms means she can get into poses that regular figmas cannot I think the looseness of the joints, especially on the left arm, just makes posing her annoying.